“Book and Bag it” is here! In the middle of a great book that you’d love to discuss with other readers? Looking for ideas about what to read next? Join us every Friday in the library during your lunch period to discuss books with other lit-lovers. These informal book discussions will take place every Friday, periods 4-7. Bring your lunch and books you would like to discuss, we’ll provide the hot beverages. Kennett High School and Kennett Middle School would like to invite you to our first-ever We Are Kennett Night for all current 6th, 7th, and 8th grade students on Wednesday, December 9th at 7:00 PM in the Kennett High School Auditorium. At this event, middle school students will learn about the many academic, athletic, and club opportunities that are available at Kennett High School. 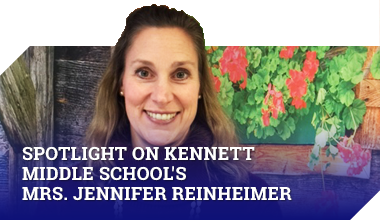 The purpose of this event is to encourage our middle school students to begin creating a vision of their educational future at Kennett High School. This will be a fun and exciting opportunity for future KHS students to meet the high school principals, teachers, counselors, and coaches. The event will kick off at 7:00 PM with a presentation from Mr. Lorenzo DeAngelis, Kennett Middle School Principal, and Dr. Jeremy Hritz, Kennett High School Principal. We hope to see you there! Kennett High School is pleased to announce its 2015-2016 National Merit Scholar Students. Congratulations to all of our National Merit Scholar students! We are proud of all of your hard work and dedication to academic excellence! Attention skiers and boarders. Forms for the Stratton Mountain and Mount Snow ski trip are available for pick up from Mr. Virgin in room S401. Space is limited, and the trip sign-up is on a first come, first served basis, so reserve your spot today. All forms and a $100 deposit are due by Friday, December 18th. We are looking for artwork and photography for the December art show at Liberty Place. If you would like to participate, please drop your work off to Mrs. Nelms in S309 by Monday, November 23rd. All work must be original and matted or framed. Original work is work that is not copied from someone else’s work or photograph.